Extra rugged with sturdy deck and channel construction. Checkered safety tread deck. Painted steel construction. Legal for Trade. Optional ramps. Anti-Skid diamond plate deck. Shock load protection. 20 foot of cable. Four internally mounted, NTEP Certified-5000 Division Class III/III L, water resistant, environmentally protected, load cells. Ideal for drums, chlorine cylinders, hazardous medical waste and other containers. Capacities ranging from 300 to 2,000 lb/150 to 1,000 kg. All aluminum self contained unit provides accuracy of ±0.1%. Available in 15 x 15 or 24 x 24 inch/metric equivalent. Can interface with an optional printer or remote display. Accumulation and printout of multiple weights. 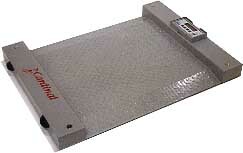 Cardinal’s Run-A-Weigh lets you put a platform scale where you need it, when you need it. Includes built-in wheels and handles, and features the popular battery-operated 758 digital weight indicator. Whether it’s multiple weighing locations at a single facility or the need to take the scale to special job sites, the Run-A-Weigh is the answer.